I received a copy of this book from Bloomsbury India in exchange for an honest review. Betty Plum who never before approached boys with romantic intentions has her eye on the new boy in school. Surely his smiles mean something or so is her wishful thinking. Toby is the typical girl magnet – mysterious with a notorious reputation. When he invites Betty to audition for vocals in his band, she is beyond ecstatic. Not realizing the compromises she would have to make, she agrees to audition. And that’s when a horde of issues land in her way; driving her to quit school, turn to her father’s girlfriend for help, upset one of her bestfriends and miss her mother more than she ever has. Would spending time with Toby mean neglecting who she really is? 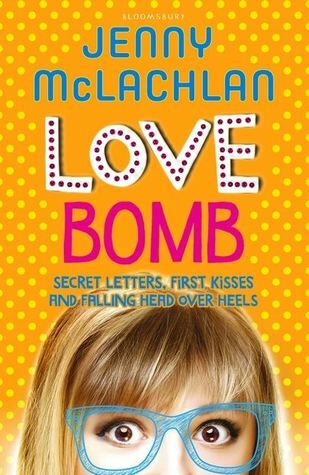 Love Bomb is a warm story of high school students and what it takes to realize the importance of loved ones. I was a little apprehensive about reading the book solely because of its title, but the cover was bright and the synopsis seemed fun so I gave it a try and read it in a day. The writing style is more on the simple side but nothing wrong with that. The story appears to cater to younger teenagers but being a 20 year old, I could still smile and understand what was going on. Because lets face it, we’ve all been there and done that! Betty lost her mother when she was two, hence, what she knows about her is through the letters that her mother wrote for her. Her relationship with her father is very friendly and you’d think she would be okay with her father moving on. But surprisingly, Betty throws tantrums and detests the idea of his girlfriend. I found that to be immature and unnecessary. Bill is her guy bestfriend and a really great, relatable character. They’ve known each other since they were babies and so share a close bond. I liked his character the best, not only because he is so well equipped with language and knows his poetry well but also because he is always there by her side. One of the best features of this book is the subtle yet essential way in which Jenny McLachlan has incorporated love quotes from different literary texts into the novel. The concepts of love triangle, bullying are pursued through this book, which we can relate with. Its a quick, light read and has a ton of fun quotient.